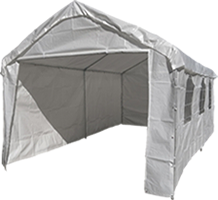 Our heavy duty 12 mil valanced canopy covers have an additional 12 inches of material on each side giving your valuables extra protection from the elements. The interior seam has grommets which attach to the frame and is out of view from the exterior of the carport. The valanced carport cover offers more protection than a flat tarp as it provides full coverage over the entire top of the frame and allows water to drain down the sides of the valance. 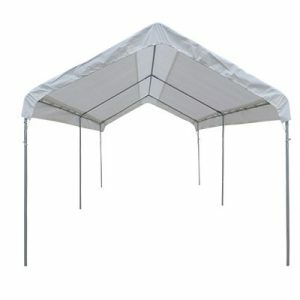 Costco 10×20 carport replacement roof cover (TOP ONLY) fits the dark brown frame with the push button assembly system. Costco 10x20 carport replacement roof cover (TOP ONLY) fits the dark brown frame with the push button assembly system. This frame measures 11' feet over the peak of the frame (please see measurement guide on home page). This cover fits the Costco frame like the original cover that comes in the kit with bungee cords. Do you need the front, side or end panels for this frame. We have them by special order, please call 541-951-2861. These are in high demand and we frequently run out of stock, call today to get yours. Not sure about size? Call us, we are here to help 541-951-2861. 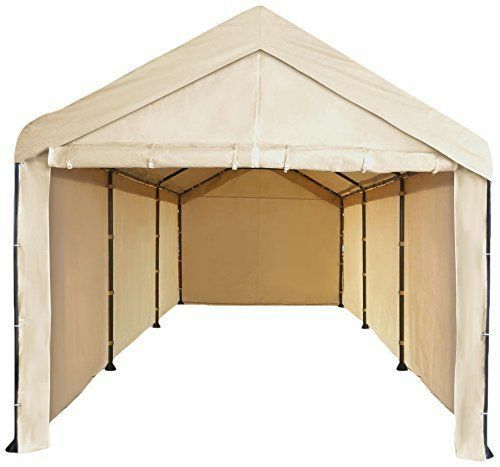 This cover comes in tan only and includes 50 ball bungees. A carport frame and cover have endless uses. Great at outdoor events, weddings and covered play areas. 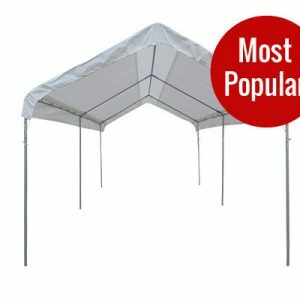 Also use at trade shows, camping, construction and as livestock shelters. Use carports and covers to shelter almost anything. Additionally, our clear covers turn your frame to a greenhouse. Furthermore, need a new frame? Visit us in Southern Oregon and see our extra strong steel carport frames. 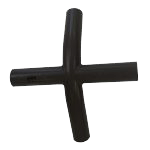 Made from 1 5/8" 16 gauge steel poles and are in addition, manufactured in the US. Need help with your size? Call us at 541-951-2861. We also have email, info@costlesstarps.com.